Pooli Suffeed Sung . The Broken Bridge at Gundumuk. bl.uk > Online Gallery Home	> Online exhibitions	> Asia, Pacific and Africa Collections	> Pooli Suffeed Sung . The Broken Bridge at Gundumuk. This is a pen-and-ink and water-colour drawing of a broken bridge near Gandamak in Afghanistan by James Atkinson (1780-1852) dated 1840. Inscribed on the front is: 'Pooli Suffeed Sung. The Broken Bridge at Gundumuk.' 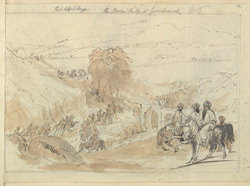 The drawing is folio 12 from an album of 17 drawings of views in Afghanistan from the Kyber Pass to Kabul by Atkinson. During the First Anglo-Afghan War (1839-42) Atkinson served as Superintending Surgeon to the Army of the Indus, a combined force of British and Indian troops. A talented amateur artist, he took the opportunity to complete many sketches en route that portrayed the mountain passes, rocky gorges and arid plains characteristic of the country. Gandamak is a village 35 miles from Jalalabad on the road to Kabul. On the retreat from Kabul of General Elphinstones’ army in 1842, a hill near Gandamak was the scene of the massacre of the last survivors of the force, 20 officers and 45 British soldiers.